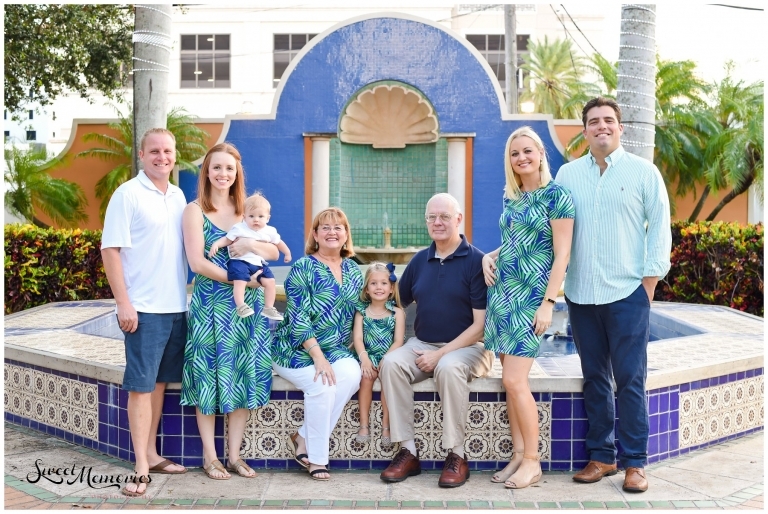 Modern Boca Mom‘s family holiday session at Boca Raton’s Sanborn Square was a tropical one. With the ladies wearing matching patterns and the men complimenting their style, this family was looking quite fabulous! They obviously came prepared for their 2017 holiday shoot! Michelle, Modern Boca Mom herself, and I first met when I moved to Boca Raton in 2016. Since then we’ve partnered up. This means that I have had the pleasure of working with her and her family now for over a year. They are the kindest, most welcoming people ever! And super stylish, as you can see by the photos below! Every year we work together on not only holiday sessions, like the recent Halloween one featuring Mickey and Minnie Mouse or this one, but other fun projects. We work together on other family milestones like Aden’s Christening and Avery’s 4th birthday. I’ve also had the honor of photographing Michelle’s first pound class (she’s certified and awesome, people!) and a shoot for Florida KidCare. So if you’re a Boca mommy or a mommy visiting the area and looking for the best things to do, best deals, or most recommended spots, go to her site! She’s amazing and one to follow! Now for what you’ve been waiting for … pictures!!! Scroll through to see Modern Boca Mom’s family holiday session! Ready to see more adorable family sessions? Go to our site and scroll through! Not good enough? We can also be found on Facebook, Instagram, and Pinterest!